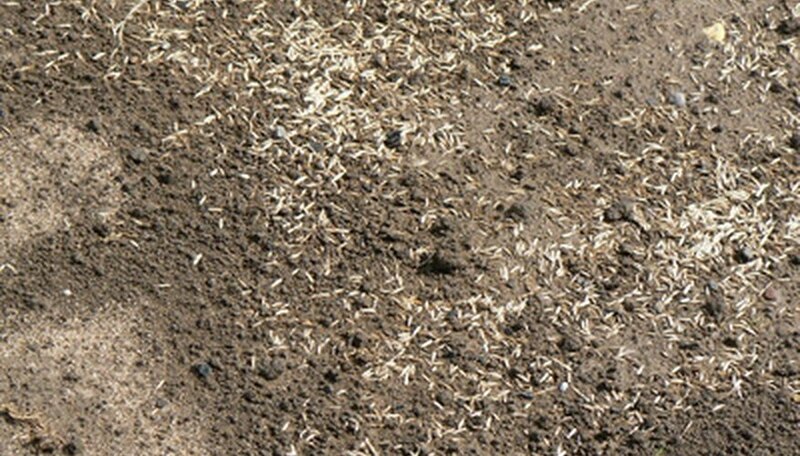 The best time to plant grass seed is in the fall. This gives the grass time to become established prior to the summer heat in central Indiana. The second best time to plant is in the spring. Plant cool-season grasses, such as Kentucky bluegrass and red fescue, in early April, according to the experts at Purdue University. Plant warm-season grasses, such as bermudagrass and St. Augustinegrass, from the beginning of April to June 15. Deliver a soil sample to your central Indiana Purdue extension office. The results of the soil analysis will determine how much, if any, lime you will need when planting the lawn and the type of fertilizer you will need. Remove weeds from the planting area. Perennial grassy weeds cannot be controlled in the spring with glyphosate herbicides in central Indiana, according to scientists with Purdue University, so you will need to manually remove the weeds from the planting bed. Rototil the planting area to loosen the soil. Remove any rocks or other debris in the planting bed. Grade the area so it slopes away from the foundation of the home. A 1 to 2 percent slope is ideal. Add any amendments suggested by your soil analysis and til them in to a depth of 4 inches. Rake the area smooth so there are no hills or depressions in the soil. Firm the planting bed by rolling over it with the lawn roller. Pour the grass seed into the broadcast spreader at the rate suggested for the type of seed. Sow the grass seeds by walking in north-to-south strips and then crossing over those in an east-west direction. Cover the grass seed with 1/4 inch of soil and roll over the area again with the lawn roller. Water the newly seeded lawn three to four times per day until the seeds germinate. Water just enough so the top inch of soil is moist, not saturated.